THIS ALBUM IS HIGHLY RECOMMENDED (though a little pricey): BUY IT AT eTHAICD. This musical style sounds very old timey and very “Thai.” The direct translation of “Luuk Tung” is “Child of the Fields,” and indeed Sanyan Sanya grew up in a family of farmers and working in the fields, and then pumping gas, until he began traveling to, and winning, singing contests, and earning a living in various bands, also as a dancer. He died five years ago, and the money from this rather expensive album goes to help his family. I knew this was going to be good when Add Carabao (or someone close to him) began posting video of him practicing the songs Karaoke-style in a bedroom or a kitchen. Grasping a water bottle or a TV remote as a pretend microphone, and straining to concentrate, he would belt out a challenging song, and nail it. The results were memorizing. If the iPhone video was this good, how good would an official studio album be? Yeah, it’s perfect. This album was a really great idea. Sanyan Sanya’s songs are just great Karaoke songs that test one’s skill as a singer. It about the vocal gymnastics, showing off one’s range, and making the most out of every note. And Add Carabao is an amazing singer . . . still. I got to meet him once, immediately after a sound check, and my first words to him were, “Wow . . . you sound as good as you ever did!” Add Carabao has already done an album of old timey songs, with a sound similar to this album: รอยคำรณ Roi Kam Ron (1994) . It is one of my favorite Add Carabao albums. Another clue to his abilities on this album would be his contribution to the recent Sek Loso cover album, which got a lot of attention on YouTube. This is one of Warner Music Thailand’s “gold edition” CDs, which means it has special packaging and bonus materials, in this case a little canvas bag with the title of the album on it. Buy this album at eThaiCD, where you can shop in English! *This the Carabao song covered by Sanyan Sanya “บาปบริสุทธิ์” (“Sin/Innocence”) was originally published on มนต์เพลงคาราบาว Mon Playng Carabao (The Spell of Carabao songs), a tribute album of covers for the Carabao 25th Anniversary) REVIEWED HERE but no longer available. 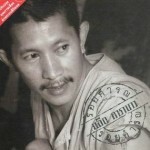 The song บาปบริสุทธิ์” (“Sin/Innocence”) was written by Lek Carabao.